Just in time for the Halloween season, Capcom have rolled out a batch of free Monster Hunter Generations costume DLC for October. The Mega Man Felyne gear is included, allowing you to dress your Palico in classic Blue Bomber duds. 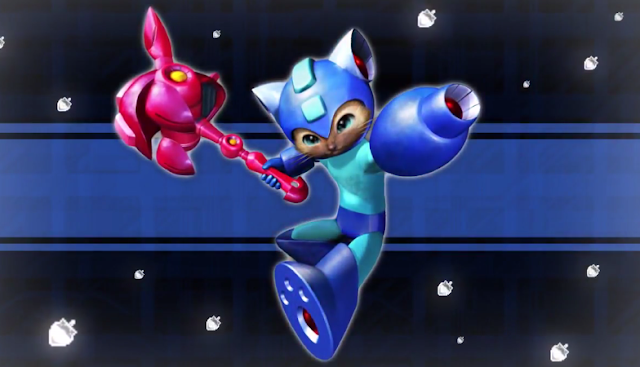 As a nice touch, the Mega Man gear changes colors at the end of each combo. It includes familiar sound effects, too, like a charging Mega Buster, Metal Blade, and life recharge (complete with an E-tank to drink). Best of all, the DLC is entirely free. It doesn't get any better than that! You can check out the full list of DLC gear and quests at Capcom Unity. And for those unfamiliar with the changes in Generations, you can now actually play as Palicoes so you can actively don this costume for yourself! The only way it could get better... is if there were other costumes, like Blues and Roll, too. Heh heh. "It doesn't get any better than that!" The only way this DLC could be better... is if there were also costumes of other characters, like Blues or Roll. But then, it'd probably be paid DLC... heh heh. Give that cat the green color Tango has and he's all set.